It is amazing what you come across on the streets of London. 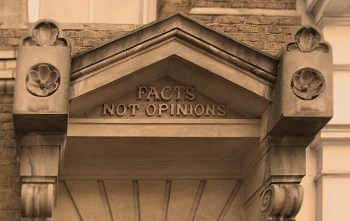 The inscription ‘FACTS NOT OPINIONS’, is carved in stone above the doorway of 99 Southwark Street, a few minutes’ walk from Equitile’s new offices. Today these words sound like a twitter-length complaint about fake-news, where opinions all too often trump the facts. The inscription owes its origin to David Kirkaldy, a remarkable Victorian inventor, entrepreneur and an early pioneer of the measurement and testing industry, which happens to be one of our favourite investment sectors. In 1874 David Kirkaldy opened his newly built ‘Kirkaldy Testing and Experimenting Works’ at 99 Southwark Street. The building was constructed to house his invention, the giant ‘universal testing machine’, which is still operational at the site today, forming the centre piece of the Kirkaldy Testing Museum. Back in mid eighteen-hundreds, as the industrial revolution was picking up pace, Kirkaldy spotted a business opportunity. In 1856 Henry Bessemer had demonstrated a new technique for turning mechanically weak pig-iron into much stronger steel. The Bessemer converter pumped air through molten pig-iron causing impurities in the melt to oxidise and separate from the molten metal. The result was a high-quality steel which could be manufactured cheaply on a large scale. Bessemer’s invention meant that steel became a viable material for the construction of machines, bridges, steam engines and ships on a large scale. The resilience of steel, relative to the more brittle cast iron or wrought iron, allowed engineers to use the new material in different ways: steel could reliably carry tensile, torsional and sheer loads. Kirkaldy understood the new applications of steel would create the need to accurately test the strength of large metal components under a variety of different loads. Having spotted this commercial opportunity Kirkaldy resigned his job in Scotland’s Napier foundry and set about designing and building his innovative universal testing machine. The machine uses a hydraulic system to subject samples to up to 1,000,000 lbs of pressure as compressive, tensile, torsional or sheer forces. Kirkaldy’s venture appears to have been a considerable commercial success. Parts were sent from all over the world to South London for testing, including components of the Eads Bridge over the Mississippi river which, when opened in 1874, was the world’s longest steel arched bridge. Today, the fact-checking testing and measurement industry, which David Kirkaldy pioneered a century and a half ago, is an indispensable part of the modern economy. As machines, materials, manufacturing processes and medical procedures become more sophisticated and food, chemical and environmental safety more important, the need for accurate measurements of physical properties becomes ever greater. We at Equitile are strategic optimists on the fact-checking industry. Four of the thirty-eight investments held by the Equitile Resilience fund could be classified as being in the fact-checking business. Two are UK based companies: Intertek and Halma. Intertek is a leader in quality assurance across a range of industries providing testing, inspecting and certification services for industries as diverse as food, pharmaceuticals and even toy manufactures. Halma is a world leader in the field of hazard detection equipment, environmental measurement equipment and medical sensing. Intertek and Halma are both long established companies with histories almost as old as Kirkaldy’s testing and experimenting works. By contrast, our other two fact-checkers, Masimo and Cognex, are much younger US companies. Masimo is a specialist in non-invasive medical monitoring technology, particularly pulse oximetry. Cognex is a leader in applying optical measurement and inspection technology across a broad range of industries from packaging to semiconductor manufacturing. In many ways, the story of David Kirkaldy spotting a business opportunity and developing a new technology to exploit the opportunity is similar to what Intertek, Halma, Masimo and Cognex are doing today. These are good examples of the innovative entrepreneurial culture we look for in the companies we like to invest in. On the other hand, the story of the Kirkaldy testing machine also serves to illustrate an investing pitfall we seek to avoid. Today the Kirkaldy Testing and Experimenting Works is a museum to defunct technology. In only a century, the Kirkaldy universal testing machine went from being a cutting-edge technology to becoming, quite literally, a museum piece. David Kirkaldy’s inventiveness and entrepreneurship appears to have led to early commercial success but does not appear to have translated into a firm with the ongoing culture of continuous innovation which is needed to survive and thrive in a constantly evolving economy. We like companies with profitable, innovative technologies like those pioneered by David Kirkaldy, but what we really look for are companies with a culture of ongoing innovation and adaption. In Intertek, Halma, Masimo and Cognex we think we have found four such companies. That said, just as we expect the companies in which we invest to adapt to survive so we see it as our duty to do the same with the Equitile Resilience Fund we manage for you. Many commentators on the investment management industry advocate a passive buy-and-hold investment strategy, arguing this benefits investors by eliminating trading costs. Buy-and-hold sounds virtuous but it requires knowing today which companies will be thriving in ten, twenty or even a hundred years’ time. We don’t pretend to have the degree of foresight needed for a buy-and-hold strategy. What’s more we are fairly sure that some of the companies we will want to invest in in the future have yet to be born; Masimo Corporation was only born in 1989 and Cognex in 1981. At Equitile, we aim to avoid leaving our client’s capital invested in companies or sectors which are being overtaken by new technology. We advocate an active ‘adapt-to-survive’ strategy rather than a passive ‘buy-and-hold’ approach. One of the ways in which we have adapted your portfolio of investments recently has been to divest from the catering and services company Sodexo. Sodexo has recently been on the receiving end of a critical piece of investigative journalism by the BBC’s Panorama team. The Panorama team sent an undercover reporter, working as a prison officer, to film inside the Sodexo managed Northumberland Prison in the north of England. The resulting documentary, which aired a few weeks ago, showed widespread drug abuse, a shocking lack of discipline within the prison and poor staff morale. Sodexo’s response to the documentary can be found here. David Kirkaldy’s ‘FACTS NOT OPINIONS’ was an appropriate motto for his fact checking industry; in the physical world he measured, objective facts trump subjective opinions. But in the social world of the economy opinions can change the facts. An asset is only worth what someone else is willing to pay for it. Ultimately, the value of your investments depend on the opinions of others; value is a social construct. Opinions of companies drive their valuations, their ability to gain finance and the willingness of customers, suppliers and employees to do business with them. Therefore, in the real-world opinions have the power to change the hard-commercial facts. For this reason, for a company to qualify for a place on Equitile’s list of approved investments it must look after both its finances and its reputation. ‘When opinions change, we change our facts. For David Kirkaldy, who measured physically-determined values, it was ‘FACTS NOT OPINIONS’, but for the team here at Equitile, who measure socially-determined value, it must always be: ‘FACTS AND OPINIONS’.